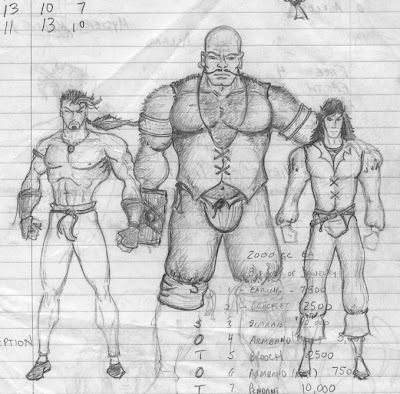 I discovered this scan while poking through some old files: an illustration by my friend Terry (sorry, I guess that's "Theron" now) of our PC's and an NPC from a solo Moldvay/Cook B/X mini-campaign we played about 15 years ago. The guy on the left is Terry's (sorry, I guess that's "Theron" now) PC, Subotai. The hairy hulk in the middle is an NPC, Olaf the Smith. (I don't recall Olaf being so hirsute...) And the guy on the right is my elf, Talisul.